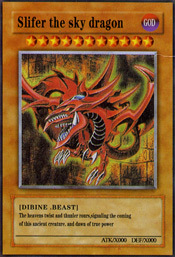 Authentic Slifer Card Recently, my son traded three common Yu-Gi-Oh cards for the coveted Slifer god card. He was very excited, thinking he worked the deal of a lifetime. Indeed, Slifer cards sell for around $35.00 apiece, depending on the dealer. Nonetheless, trading three worthless cards for a Slifer god card seemed like a phenomenal deal.. What we discovered next nearly dropped us to the floor — the Slifer card was a counterfeit! Within moments of checking it out, Mom immediately recognized the unusual coloring, odd syntax, and heavy gloss on the card. 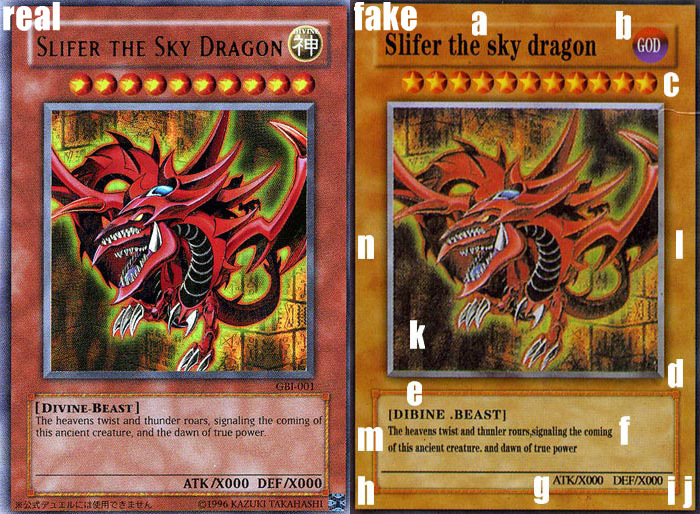 Upon closer examination, many errors were discovered — spelling mistakes, missing graphics, and misaligned text — all pointing to one inescapable reality: an illegitimate Slifer card! Counterfeit Slifer Card Amazed by the idea that someone would actually produce a fake Slifer card, I quickly confiscated the card and began scrutinizing the various details and differences. After studying the card, carefully comparing it to other Yu-Gi-Oh cards and several legitimate Slifer cards (via dealer sites, etc. ), the extremely poor quality of the counterfeit became laughably obvious. This is sad for at least two reasons. First, it is sad that there are scumbags who steal from children. Second, it is sad that a counterfeiter would perform such an absolutely pathetic rendition of the very popular Slifer Yu-Gi-Oh god card. Nonetheless, discovering and studying the counterfeit card provided such a thrill that we thought others might benefit from a critical online analysis. Hopefully, this article will serve as a reference for others to compare against in order to avoid the purchase or trade of other fake Yu-Gi-Oh cards. If nothing else, we hope that you will enjoy a hearty laugh upon discovering the amateur nature of this particular counterfeit. The brand name, “KONAMI” and registered symbol (R) missing from upper-left corner Apparently, authentic god cards display neither brand name nor registered symbol on the back of the card. Trademark signature (TM) missing from Yu-Gi-Oh logo in lower-right corner Apparently, authentic god cards do not display a trademark signature on the back of the card. We hope this article is helpful to someone. If you have other examples of counterfeit Yu-Gi-Oh cards, we would love to hear about them. Update: I posted a new article highlighting Deana’s experience with a counterfeit Slifer card she had purchased on eBay. Interesting (although not too surprising)..
You are all yugioh nerds. Who cares about this stuff. Why would you try to study it it’s obvious it’s fake you nerds. What parents go through so much anyways to find a fake card I mean you should have quit this game along time ago. Geez, i wonder how long your son will play it. By far, one of our most enlightening comments here at Perishable Press.. Thank you, jack frei, for amusing us all with your incredible wisdom. Thanks for the article, Mr. Frei comments aside, this is useful for us nerds that continue to play the game. It seems a well branded dept store just sold me some fakes and I am researching to reinforce my claim. Now is that not worth pursuing. Thanks again Perishable. Us nerds would be very interested to hear more of your experiences with this as the process unfolds.. Keep us in the loop! I returned the cards to the well branded dept store in Thailand and incredibly the sales immediately said, yes these are copies and If I wanted the real cards, I need to pay double. They offered a one to one swop but I preferred to buy them where I know what I am getting. Being a well known store they immediately gave us our money back with no questions asked. It is not comforting to know there are formal channels to get these fakes to market and then onto sites like ebay. Thanks again for the guide to spotting fakes, this and the fact that my son said there is no such card as “Super Vehicle Drill” convinced me to return the cards. I recently purchase the captioned at the Paragon store’s toy department and after some investigation found that the product was indeed fake. Upon returning the product to the store the salesman without hesitation said it was a copy. I was given a full refund and without any questions asked. While I appreciate the customer service at your store, I am quite taken back that you would be selling fake and illegal toys. As one of many foreigners/vacationers that visit your store and pay a premium for your products, I find this totally unacceptable. I am sure upon hearing of this, the situation would be corrected. My intent in this email is not to bring publicity to this situation but to suggest to yourself and Upperdeck to be more vigorous in preventing such products to reaching the consumer. "Super Vehicle Drill" — that’s hilarious!! I am not surprised that the store reacted as it did — nobody wants the Konami suits suing the family business. It almost sounds as if the store may be in on the scam, scoring cheap, counterfeit Yu-Gi-Oh cards on the side and then reselling them at full market price. I would not buy any more cards from their store(s), nor would I trust any of the cards already purchased as being legitimate..
How sad it is that there are unscrupulous bastards out there that insist on beating the system by ripping people off and stealing from children. Sadder still that their illegal business of choice doesn’t seem to rake in enough cash to hire a halfway decent counterfeit artist. Utterly pathetic. Nonetheless, thank you for sharing this insightful information with us. Let us know if anything else develops. Good luck! I replied that I will file a case. In restropect, I was going just eat the cost and not waste another half day at the store to get a refund, but in looking at my son’s reaction, it seem the right thing to do. We were offered a store credit but everything was 200 to 300% more then what I know the price to be. As I walked out of the dept. store at the same level and there was the Lamborghini, Maserati, Lotus, and Jaguar dealership and it was then that I thought at least I should inform the store on what they were selling (the thoughts of your comment about someone suing the family business crossed my mind). This is really fascinating stuff.. I wonder why the email to the store bounced. Smells like firewall to me, but it could be a super-strength spam filter or something similar. If you have their mailing address, you could always send them a quick note through the mail, although your efforts are perhaps better focused on Upper Deck, as they are most likely in a much better position to actually do something about it.. When it comes to the Yu-Gi-Oh! TRADING CARD GAME, counterfeiters spare no expense. You would think that the UD suits would take advantage of the opportunity to reach out, help their customers, and work with the media to educate consumers about the situation. Perhaps children, parents, and collectors would stop buying so many Yu-Gi-Oh cards if they realized that so many of them were fake. Regardless, I am stoked to hear that you will be filing a case. Good luck with it!